This is a re-working of a post from 2011 because I got to thinking it was time again to talk about author Earl Emerson (I haven't done so in a while) and this is one of my very favorites of his many books. Shamus Award winning author Earl Emerson was a Seattle firefighter for 32 years so when he writes about fire, fire-fighters, fire-fighting and all relevant accoutrement, he knows whereof he speaks. His on-the-job knowledge adds a rich verisimilitude to his writing - if the plots concern fire in any way (and they often do), all the gritty details will be right. Besides that, Emerson has a fine sure hand with an intricate plot and a gift for inventive characterization and smart-guy dialogue. Often labeled a 'regional' author, because he lives in and writes books set in the Pacific Northwest, Emerson is not, perhaps, as well known here in the east as he should be. I discovered him a few years ago and have been a fan ever since. 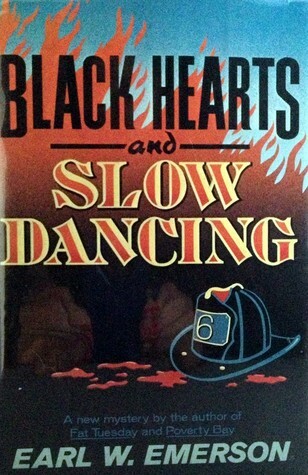 BLACK HEARTS AND SLOW DANCING is the first book in the Mac Fontana series. (Did I mention that Emerson also has a gift for titles? One of my other favorites is, HELP WANTED: ORPHANS PREFERRED. Staircase, Washington, is a small town at the base of the Cascade Mountains. It is 'interim' Sheriff and ex-firefighter MacKinley Fontana's current neck of the woods. A 'live and let live' kind of guy, he's happy enough there, sorting out his life and raising his son Brandon. But now that he's found a dead body lashed to a tree, Mo Costigan, the major, is having second thoughts about Mac's interim job. It's not as though he were the 'real' sheriff. But Mac is no pushover. Just see the way he handles Satan, the ex-sheriff's intractable German Shepherd. The dead man turns out to have been a firefighter and Mac, an ex Seattle firefighter himself, wants to find out why he was killed - beaten to death. Against the mayor's wishes, he heads up to Seattle to nose around - Mac has a nose for greed and corruption. But by doing so he winds up opening old wounds and making himself a few more enemies. Mac's been trying to settle into 'normal' after some hard times involving his firefighting past and a mysterious job out east in that 'other world' he doesn't like to think about. But someone in Staircase doesn't like the way Mac's investigation into the fire fighter's death is going. When he's shot at and left for dead and the town's biggest church goes up in flames Mac comes to the realization that life in a small town is not going exactly the way he envisioned it. Mac Fontana is a hard-driven guy with a twisted sense of humor and a fondness for the relative quiet of the countryside. But it's going to take him a while to get into the slower, easier rhythm. (Being shot and church fires not withstanding.) In the meantime, he's raising his boy and doing the best he can. Emerson's writing in the scenes between Mac and his son is especially appealing. He writes those so naturally, yet when Mac is dealing with some ugly, nasty types, those scenes evolve equally well. There's nothing forced here, just a kind of fluid writing ability I like. I think this stems from having well-rounded characterizations - Mac's interactions arise organically from who he is. Last but not least, I love that Mac Fontana, bad as he wants to be, loves to slow dance at the local weekly dances. There he and the Mayor, Maureen known as 'Mo' work out their antagonisms with a few smooth moves. Mac Fontana, a man of many talents. Earl Emerson, author of many talents. I really do wish there were more books in this particular series. But not to worry, Earl Emerson has also written several stand-alone books as well as the very engaging Thomas Black series featuring a private eye working in Portland, Oregon who gets involved in often bizarre cases. Check out his Fantastic Fiction page for all the titles. Since this is Friday, don't forget to check in at author and Edgar Award nominee Patricia Abbott's blog, Pattinase, to see what other forgotten or overlooked books other bloggers are talking about today. Thanks, Yvette, for the introduction to EE. I will be on the lookout for his books. You won't go wrong, Elgin. EE is a terrific writer. Here's someone I'll definitely look into. He has a book called CAPE DISAPPOINTMENT. Joe and I camped there when we visited Washington two summers ago. Have to find that one! CAPE DISAPPOINTMENT is the last (I think) of the Thomas Black series far as I know, but if I were you I'd read a couple of the earlier Thomas Black books to get a feel for who he is. There are no bad books in that series at any rate. I pick up Earl Emerson's books whenever I find them. You're right about his expertise with fire. I'm glad you're a fan, George. Sounds really good, Yvette! We are having our annual library book sale and I'm helping sort and set up. I'll keep my eyes peeled! Next weekend is the huge book fair the Kingsport TN library puts on. I've got my list of authors to look for ready! This area is wonderful for an old book lover like me! Oh, I am SO jealous, Peggy Ann. Yes, do keep an eye out for Earl Emerson's books. Snap them up if you find them. Also, keep an eye out for Philip MacDonald's books too! Titles, oh yeah! This one is a lulu, Yvette--enuf, along with your scintillating review, to nudge me into the read column. I think you'd like Emerson's books, Mathew. They're easy enough to find. And yes, most of his titles are doozies.